www.materialforless.com for more information on the vast inventory plus take a virtual tour via flying drone. Finally an affordable CVG Western Red Cedar Tongue and Groove for your Blue Ribbon Sauna project. Nice old growth Clear verticle grain KD material in 1 X 4, 3-1/8″ coverage. 6 to 12 foot long. $1.39 per linear foot if you buy 500 linear feet buying random length 6′ to 12′, You must buy a variety of lengths. $1.59 per linear feet by the piece otherwise. Lots of matching Cedar for trim, doors and furniture benches to finish of your sauna. Huge selection too of outdoor Cedar in Western Red and Alaska Yellow from Utility to CVG and everything in between! Of course our huge warehouse and giant outside is filled with bargains like Shiplap, Tongue and Groove for wall, ceiling and floor coverings. Douglas Fir T & G, Alaska Yellow T & G, beaded ceiling, bead board, wainscot and many other options. Literally the largest choice in these products you will ever see. We also have many choices in Douglas Fir Flooring, beadboard, and other tongue and groove products always at LOW prices. Get that ship lap look or paneling look for your wall and ceiling. Many options available for the popular ship lap or panel look. Available often in Hemlock, Western Red Cedar, Pine, Spruce and Alaska Yellow Cedar. See the largest door collection at over 1400 doors on our warehouse floor to view. Of course low discount prices. Kitchen and bathroom knobs, pulls and handles in nickel, bronze and cast iron. These are priced well below retail many over 50% off. Composition Roofing is something we get in A grade at times. Call for details, the prices are low. Barn Doors and barn door industrial look rollers and track. An amazing value and collection with Custom doors built to order. Wood shingles, Lap siding, Stair treads, stairway and guardrail / handrail components, Deck screws and roofing screws for metal roofing, and so much more you have to take the 4 hour tour to see it all. 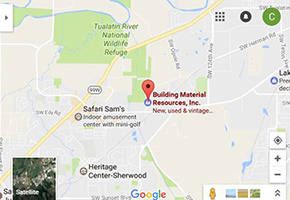 We are a small family owned Business and try our very best to help you solve your Building Material needs. Just a short Drive from Sherwood form I-5 or 99-W, well worth the drive according to all the returning contractors and home owners who truly recognize value and service. We are starting our 11th year in Business helping our customers come in way under budget on their projects. And now special order doors, windows mill work and it continues to grow thanks to you. Daniel, Stefan, Olivia and our crew Say’s “Thank You” Its our great and faithful customers that we appreciate, so join us in making your project beautiful, creative and costing you less.